Recently, I am continuously being amazed by how a seemingly simple task is actually implemented in a sophisticated way. I guess I am just taking so many things for granted just because it was implemented and refined to an extent that I don’t even feel it. When someone asked me “how do you reverse and then find the complement sequence of some DNA?” I googled and found a couple of functions, and then I decided to challenge myself to re-invent this wheel. Since I want to accommodate both DNA and RNA, one extra thing I did here was to distinguish them by the presence of uridine (“U”) in the sequence, which is specific to RNA. Now, I have functions for reversal and complementation. Let’s test if it works . It looks okay, but it’s in fact failure prone. You might notice that my script assumed the sequences to be in upper case, which might not always be true. Additionally, if anything other than the bases, like a number or “X”, is passed to the functions, the functions do not know how to handle them. Wrap the two naive functions from above. Handle the issues that are foreseeable. Ok, I’ve made my “wheel”. It’s time to see if the wheel rolls well. Considering how long genomic sequences can be, I chose running speed as the benchmark here. Though the way I look for legal bases and that grepl() I used to check if a sequence is RNA posed extra computation on the function, a hundred thousand bases in 0.18 seconds feels reasonably fast. 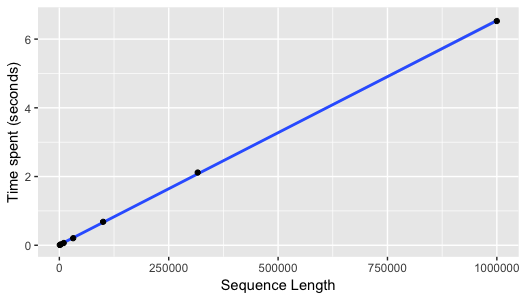 Converting several sequences with their length ranging between 1 kilo bases to 1 mega bases shows the time required for conversion increases linearly with sequence length. It seems to make sense, since I every base is examined and converted independently, so no extra work should be introduced with a longer length. Notes, thoughts, and random experiments in life science.